Raith Rovers manager Barry Smith praised his players after this afternoon’s 1-1 Betfred Cup draw with Hearts. He said it was an “excellent performance” which showed what his side were capable of. In truth Rovers were lucky to take a point after a late Christophe Berra header was incorrectly chopped off, but it was a much improved performance from the Kirkcaldy side after the poor show against Cowdenbeath last week when they lost 2-0 in their opening Betfred tie. Rovers started the match at East Fife’s Bayview with three across the back in the shape of Benedictus, Murray and Mackay, with Kevin Nisbet employed as a lone striker. The Jambos lined up in much the same way and though the Edinburgh side probably edged the first half, there was little between the sides as Rovers defended well and dealt with any threat posed by the Jambos. A Kyle Lafferty shot deflected narrowly past the Kirkcaldy goal and a tremendous block from Murray stopped Olly Lee from shooting at goal, but the best chance of the half fell to Rovers. Euan Valentine crossed from the left and an unmarked Jamie Watson headed past at the back post when it looked easier to score. Just before half time Lafferty sclaffed a chance which he could have done better with, injuring himself in the process. The Northern Ireland international was subbed on 51 minutes as a result, directly after Raith opened the scoring. Wing back Nisbet made a great forward run towards the Hearts box and played the ball to Grant Gillespie. His shot was blocked and fell to the feet of Nisbet who had continued his run. He looked as though he may have been offside, the Hearts defence hesitated, Nisbet didn’t and slotted the ball into Zlamal’s net. Milne replaced Duggan on 61 minutes, with goalscorer Nisbet pushed into the striker role and two minutes later Rovers should have doubled their lead. Milne played the ball to Nisbet who in turn slotted the ball to Gillespie who bore down on the Hearts goal from an angle. The striker should maybe have shot for goal but seemed caught in two minds as he played the ball across the face of the six yard box where it was cleared. It would prove to be a crucial miss as Hearts went on to equalise. After failing repeatedly to break through the stubborn and well disciplined Rovers defence it took a 25-yard wonder strike from Michael Smith to bring the Gorgie side back into the match. 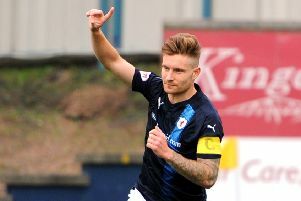 Nisbet was replaced by Ryan Stevenson on 79 minutes, Rovers ending the match with a third player as lone striker as Milne went up front. As might have been expected Hearts pushed hard for a late winner and goalscorer Smith almost doubled his tally; played in by Kirkcaldy’s Anthony McDonald his shot took a deflection which pushed it narrowly over the bar on 88 minutes. Then came the moment of real controversy – on 89 minutes a Bobby Burns corner was headed in by Berra but referee Don Robertson ruled it out for a foul on Thomson. TV replays showed that Thomson had actually been blocked by one of his own defenders – a real let off for the Rovers. But Hearts weren’t finished yet, Morrison, Keena and Berra again all came close as Rovers defended desperately. In the end, the match finished 1-1 with Hearts taking the bonus point by winning the penalty shoot out 4-2, the main talking point being Ross Matthews miss which actually left the ground. Boss Barry Smith said: “They took a bit of stick last week from myself and others after the Cowdenbeath game but today I think they showed what a good professional team they are. “It took Hearts a wonder strike to get their goal and I thought our shape was very good today. “For as much as Hearts had a lot of possession I think if we had got that second goal our boys showed enough that we could have gone on to win it. Smith also praised his side’s youngsters saying: “We’ve got a lot of injuries and we’re asking young boys to come in and do a man’s job and were asking guys who aren’t quite 100 per cent fit to come off the bench. Raith Rovers: Thomson, Watson, Valentine, Davidson, Murray, Benedictus, Duggan (Milne 61), Gillespie, Matthews, Nisbet (Stevenson 79), McKay. Subs: McGuff, Berry.